Power for the Beard residence outside Reno, Nevada is provided by a Bergey XL.1 1,000 W wind turbine, 1,000 W of solar, and a 12 kW back-up generator. Besides the usual complement of high-efficiency lights and appliances found in typical off-grid homes, the Beard home is air-conditioned. 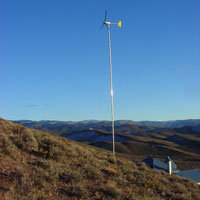 The system was installed in December, 2002 by Alternative Energy Solutions in Reno. This was a difficult installation due to the sloped terrain and the rocky soil. The XL.1 is installed on a 13m (42 ft) Tilt-up tower. 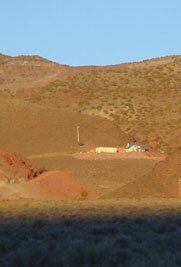 BWC recommends against installing on a slope, if possible, because of the slanted wind flow through the rotor, but in this case the hill behind the house was the only area available for the turbine. Note the above ground electrical conduit and custom rock anchors required due to the rocky soil.